Hiroshima will forever be connected to the atomic bomb, but it’s not a radioactive wasteland. Today it’s a thriving city with over a million citizens. The modern city includes many great attractions, most of which can be reached by foot or train. Even if you only have one day in Hiroshima, you should be able to hit the top spots. 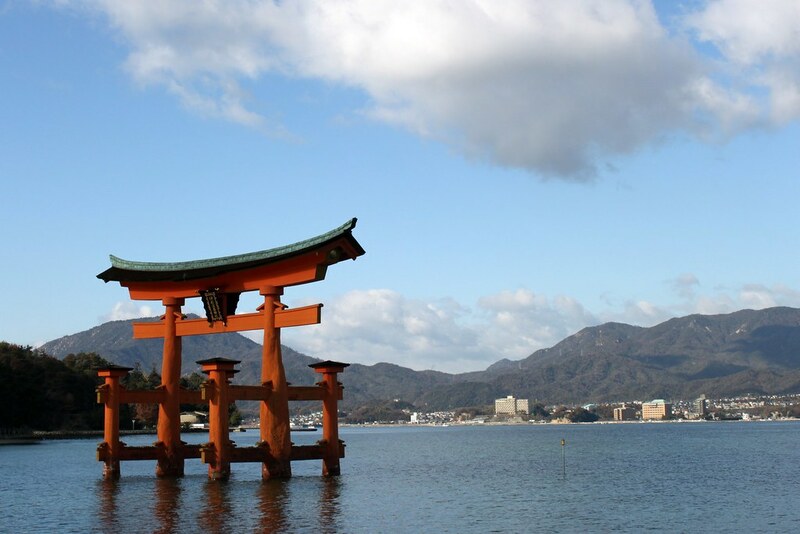 From the site of the atomic bomb memorial to the magical floating torii gate outside of Itsukushima Shrine, Hiroshima is a mixture of ancient and modern history. While 24 hours in Hiroshima may not seem like a lot of time (as with all of our one-day city itineraries), the main attractions are conveniently located quite close to each other. The furthest destination is Miyajima Island, one of the top places to visit in Japan, and even that only takes about 40 minutes to reach. If you want to make the most out of your Hiroshima itinerary, start bright and early. For a large portion of the trip, you’ll be walking around the city, so ensure that you have a comfortable pair of shoes. If your feet get tired, or you want to move a bit quicker, you can always rely on the train stations located throughout the downtown area. Preparing for your Hiroshima itinerary? Don’t forget to protect yourself with travel insurance! Depending on how you arrive in Hiroshima, you’ll likely start your day at Hiroshima Station. While you could head straight for your first sightseeing destination, you may want to fuel up with a snack. You’ll find quite a few options in and around the station, including coffee and Western-style fast food chains. Skip these options and try a local treat: Momiji-Manju. It’s a small pastry shaped to resemble a maple leaf and stuffed with different fillings. While it’s traditionally filled with red bean paste, you can find these small cakes stuffed with anything from cream cheese to chocolate. It also holds local significance as the maple leaf is the traditional symbol of the city. After grabbing a quick bite, your next destination is Miyajima in Hiroshima Bay. You can reach the island as early as 6:30 AM. With just 24 hours in Hiroshima, it’s important to start early. The fastest way to get to the island is to take a train from Hiroshima Station to Miyajimaguchi Station, which puts you right next to the ferry pier. The entire trip including the ferry ride is about 40 minutes. Miyajima means “shrine island” and is home to the Itsukushima Shrine. The main building and its iconic large torii gate are right in the bay, and, at high tide, give the sense that they are floating. While many travelers choose to visit the island later in the day, you’ll appreciate making it your first stop. The early morning skies are a more spectacular backdrop for the giant torii gate. Going early will also help you beat the crowds, allowing you to explore the island and still have plenty of time for more Hiroshima sightseeing. 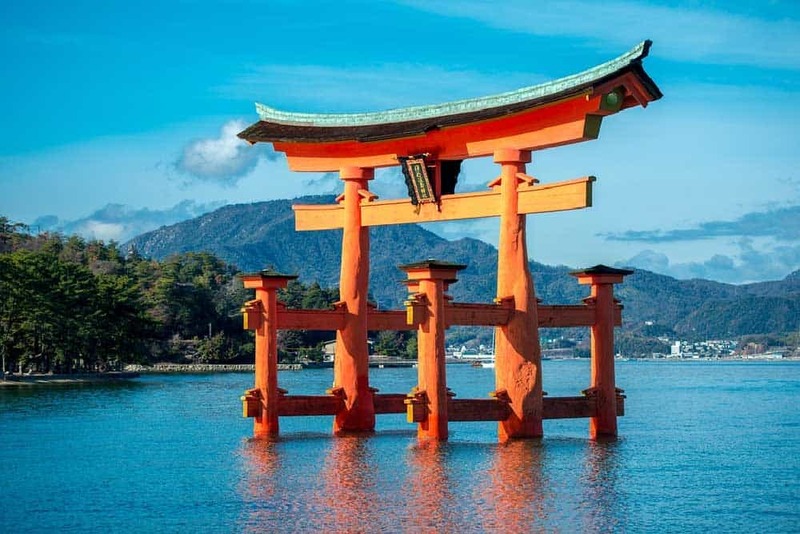 The main attraction on the island is the Itsukushima Shrine, a UNESCO World Heritage Site, which takes just a few minutes to reach after getting dropped off by the ferry. Spend some time marveling at the floating torii gate and the shrine buildings before heading toward Mount Misen. When you finish taking pictures of the shrine and surrounding buildings, it’s time to head to the highest spot in the island. At 500 metres above sea level, Mount Misen offers wide-open views of the surrounding islands and bay. Luckily, you don’t need to hike to the summit. 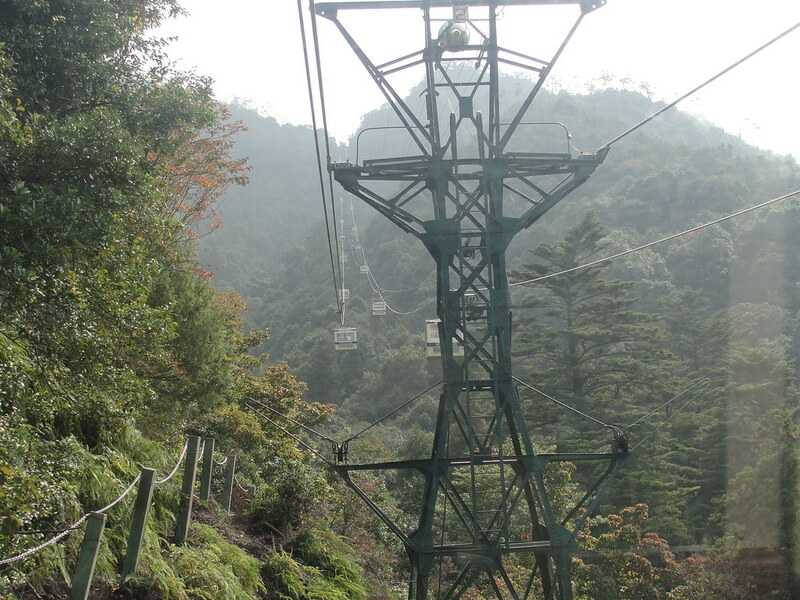 You can simply catch a ride on the ropeway. The cable cars take people up and down the mountain with each trip taking only about 15 minutes. There isn’t much to do at the top except to take in the sights. Within a few minutes, you may want to start making your return trip. If you’re worried about time, you can take the ropeway back down. If you’re making good time, however, follow the path down to the town. As you walk the pathways to the town, you’ll probably encounter deer. They roam freely through the area and are a common sight in most parts of Miyajima island. You can grab a bite in town or make your way back to the mainland. There are several great restaurants on the island. As you may expect, seafood is their specialty, particularly oysters, which are grilled and served with butter or soy sauce. The fastest way back to downtown Hiroshima is the way that you came unless the ferries are starting to get too crowded. Another option is to take a direct boat from the island to the Hiroshima port, which places you within a stone’s throw from Hiroshima Station. The direct boat ride is considerably more expensive and includes about the same amount of travel time. However, on a busy day, it may be a little more relaxing compared to riding on a crowded ferry. When you get back to the downtown area, it should still be early in the day, depending on what time you started. If you haven’t had lunch yet, there are several restaurants along the way that serve Hiroshimiyaki. Hiroshimiyaki is Hiroshima-style okonomiyaki. If you’re not familiar with the dish, okonomiyaki is a fried pancake covered in a mixture of cabbage and vegetables. Typically, the ingredients are mixed together in the batter to create a savoury pancake. The Hiroshima style involves layering the ingredients on the pancake instead of mixing them together. After lunch, it’s time to explore more of the downtown area and the most famous site in the city. The sprawling Peace Memorial Park is an essential destination for your Hiroshima itinerary. 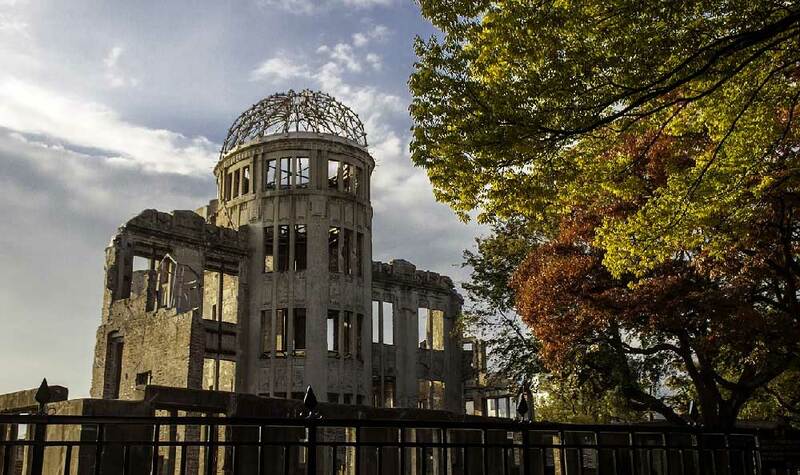 It serves as a reminder of the importance of peace and the tragedy that occurred when the bomb dropped. The atomic bomb is the first thing that people think of when discussing Hiroshima, and as such, is a must-see. The park includes several memorials, a museum, and landmarks in memoriam to the over 200,000 people who died that day. When exploring the park, you’ll see the top of the Atomic Bomb Dome, which is part of the Hiroshima Prefectural Industrial Promotion Hall. The hall remained mostly intact after the bombing, including the metal framework to the dome on the top of the building. The building still stands and has remained as a memorial. By the middle of the day, the park and the museum should be crowded. However, most of the sites in and around the park are spread out and provide plenty of room to wander around and take photos. As you walk around the park, try to find ground zero. The hypocentre of the bombing is directly below the spot where the bomb was detonated 600 meters in the sky. Surprisingly, the hypocentre doesn’t include a large memorial and can be difficult to find. It’s found on an ordinary side street containing a medical clinic and a few other businesses and consists of a simple marble monument with a plaque. The atomic bomb dome is right across from your next destination. From the upper floors of the Hiroshima Orizuru Tower, you can get a beautiful unobstructed view of Hiroshima. Besides the view, there are several activities to enjoy inside the tower. You can grab a cup of coffee from the café or learn how to fold an origami crane, a Japanese symbol of hope and healing. When you get back outside, you’re allowed to add your paper crane to the wall. Note that you can cut the cost of admission to the tower in half by simply showing your passport. Without your passport, you’ll need to pay full price. You have two ways to exit the tower. You can take the stairs or have some fun and opt to take the slide. Just remember to take your shoes off to enjoy a smooth ride down to the bottom floor. By the time that you finish your trip to the tower, it should be getting a little late in the day. Start walking northeast across the Aioi Bridge toward shopping, dining, and drinks. The Tokaichimachi area is in a central part of Hiroshima and includes a dense collection of residential and commercial blocks. Here you’ll find a wide selection of places to shop and eat. In the evening, many of the area cocktail bars start opening their doors. While the area doesn’t have a thriving nightlife, you can still have a good time exploring the neighborhood and trying to find various watering holes. As your night winds down, there are several stations in the area that can take you directly back to the Hiroshima Station. In just a single day, you’ve explored the most important landmarks in the city and hopefully got to taste most of the local cuisine! Unlike other Japanese cities, choosing where to stay in Hiroshima isn’t so complicated. The city centre, where you’ll find many of the top attractions and the man transportation hubs, is relatively compact and easy to navigate. Daiwa Roynet Hotel Hiroshima: Located in the city’s commercial district, this budget-friendly 3-star hotel offers spacious rooms with simple modern style. Peace Memorial Park is less than 10 minutes away by foot. Hotel Granvia Hiroshima: A well-priced hotel conveniently connected directly to Hiroshima Station. Rooms are modern and quite large by usual Japanese standards. Six on-site restaurants and a massage service shoot this property well above its 3-star rating. Rihga Royal Hotel Hiroshima: A contemporary mid-range hotel featuring rooms that are gargantuan compared to most in other major Japanese cities. For sightseeing, it doesn’t get much better than this as many of the top attractions lie within a short 5- to 10-minute walk. Candeo Hotels Hiroshima Hatchobori: In a city surprisingly short on high-end luxury, this lovely brand-new 4-star hotel fills the void. Rooms and spacious and modern, but its the hotel’s relaxing & atmospheric onsen that really kicks this place up a notch.